It’s always nice, amid today’s political climate, to know there’s still hope left for humanity. Most recently, a kind Illinois IHOP waiter went viral after he was photographed helping a customer who has Huntington’s disease eat. Another customer, Keshia Dotson, snapped the photo from her seat a few tables away. The waiter’s name is Joe Thomas. 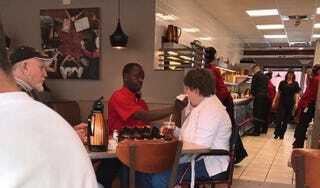 Dotson posted the picture to the IHOP Facebook page, telling the company how impressed she was by Thomas’ service. That picture got several likes, comments and shares, including remarks from people who knew Thomas personally. According to CBS News, for the past 11 years, Thomas has worked at the same Springfield, Ill., restaurant and knows all his “regulars” by name. CBS notes that Thomas came to know the woman with Huntington’s disease, as well as her husband, both of whom visit the IHOP at least once a week, and he noticed that the woman’s husband—who is also seen in Dotson’s photo enjoying his meal—would always feed her first, basically allowing his own food to go cold. Then one day the caring waiter decided to step in, waving away her husband and cutting up her eggs and feeding them to her. The man accepted Thomas’ offer, and basically from that day on, it became the trio’s routine. Thomas is apparently used to being a caretaker, having worked in a rehabilitation center for about a year prior to starting his job at IHOP. His mother died of diabetes, and his father was diagnosed with prostate cancer.